We got an email from some readers recently, proclaiming themselves to be “Our Number 1 fans from Seattle”. You boys will have to battle that title out with some of our other Seattle fans…..
Yeah the suitcase, and books, and even the tractor seat intrigued us, but we really caught us by the throat was the white-on-black art piece. How clever is that? We asked how they did it……. I moved into a contemporary condo that is Triple B – Beige Builder Basic. Like most other renters, I am not allowed to make any permanent changes to the décor of my apartment. 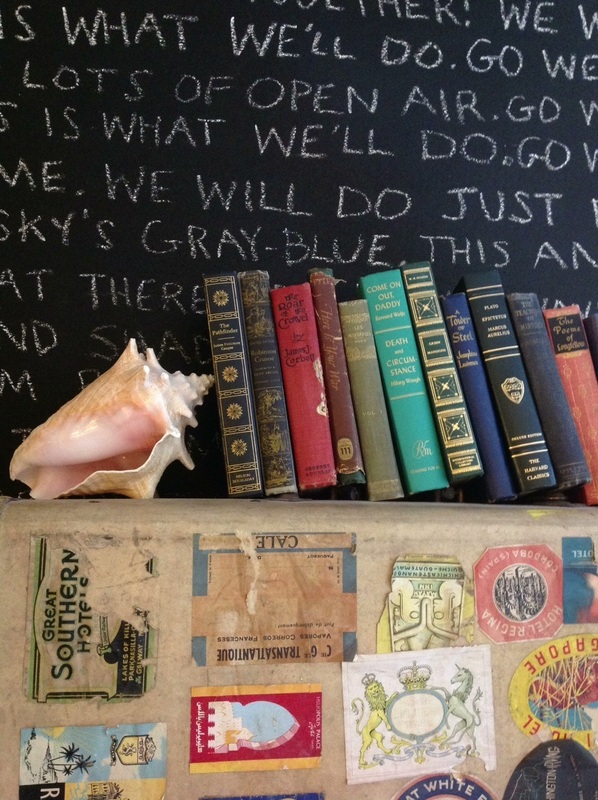 Although I love the look of chalkboard paint, I cannot repaint any of my walls due to strict tenant guidelines. 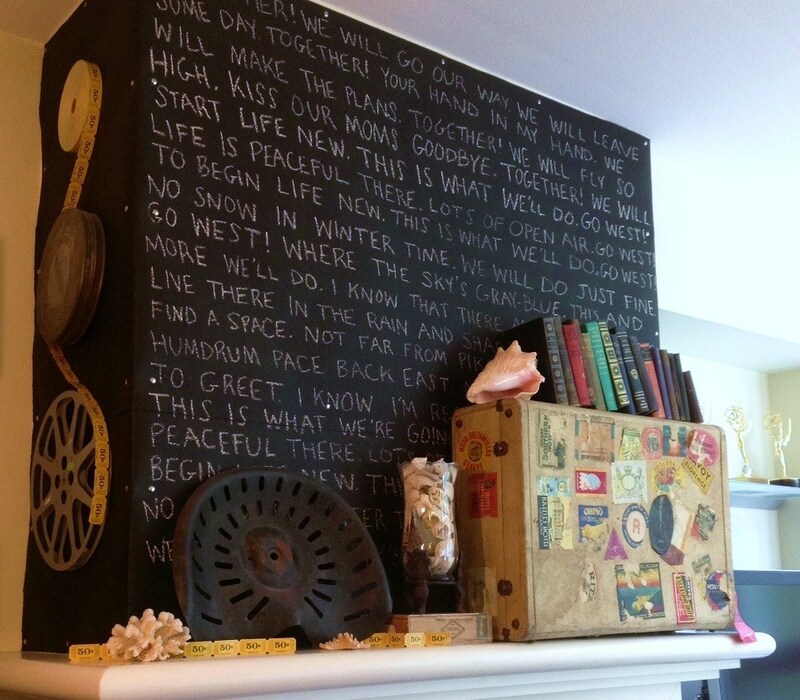 I used roofing paper, thumbtacks, sidewalk chalk and hairspray to personalize my fireplace with a temporary chalk art solution. I cut the paper to size and wrapped my fireplace walls to create a canvas that was both blank and black. Like non-adhesive wallpaper, I tacked the roofing paper above the mantel, taking additional care to secure the corners with extra thumbtacks. Once I had my writing surface, I chose my content. Joe and I moved to Seattle because he works for NBC and took a new position with the Seattle affiliate. The move happened very quickly – so quickly that we pretty much moved with nothing but clothes. In truth, we own a condo in Minneapolis (where we are from), and with no time to sell it, we decided to rent it furnished. As such, we literally left all decor and furniture behind. As we drove our loaded Honda to the Puget Sound through Mt. Rushmore, Cody and Yellowstone, we blasted “Go West!” (Both the Village People and Pet Shop Boys version). Hence, the textual choice on our wall. I chose the words to the song “Go West” as text – with some personal twists on the lyrics. While you could trace ledger lines with a pencil, I chose to write freeform, holding a yardstick as my guide. As a final step, I sprayed the entire surface down with aerosol hairspray to prevent smudging. You can specifically buy fixative art spray, but as an art student, I always used hairspray as a money-saving substitute. Plus, it’s also good for rooms with poor ventilation. Before using either, spray a test area to make sure there isn’t any discoloration. Most roofing paper is asphalt based, so it may scuff your walls. As you hang the paper, be precise so you don’t smudge the surrounding surface. For any accidental marks, soapy water and elbow grease should do the job. Unlike a traditional chalkboard, tar paper is not forgiving; in other words, you probably won’t be able to erase any mistakes. Write carefully so you don’t have to start over and rehang your paper due to a typo. Thanks Peter, for sharing your creative art solution. Wish I had thought of that……..
We made it into yet another Apartment Therapy contest where people judge our lack of style…. 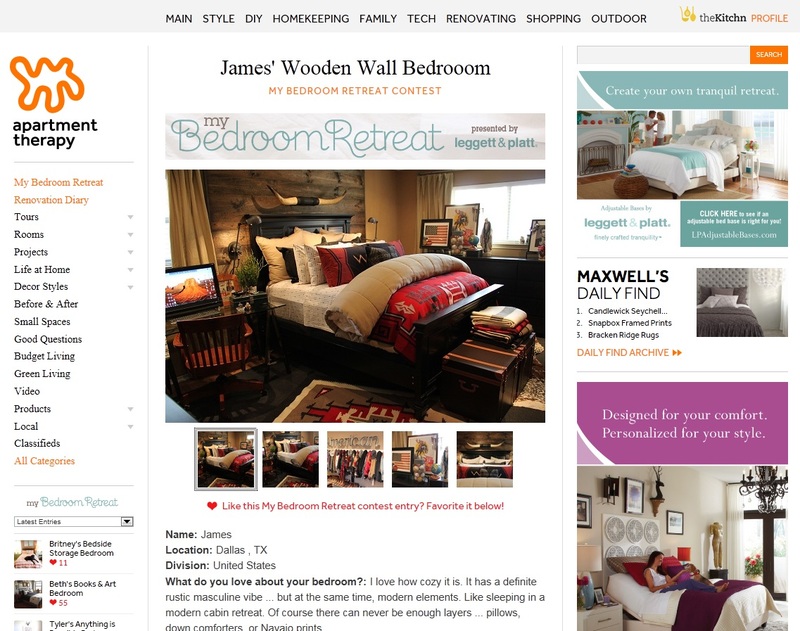 That’s our fluffy, Texas-ISH bedroom, and of course our offensive longhorns and exorbitant amount of pillows, on the Apartment Therapy Bedroom Retreat Contest. For all of y’all wondering….No, we don’t sleep with all those pillows on the bed with us. Half of them are gently stacked it the corner most of the year………unless, there is a photo shoot, or someone worth while is visiting. Oh Oh Oh!!!! Don’t forget to read the comments that the A.T. community has left about our simple little room. 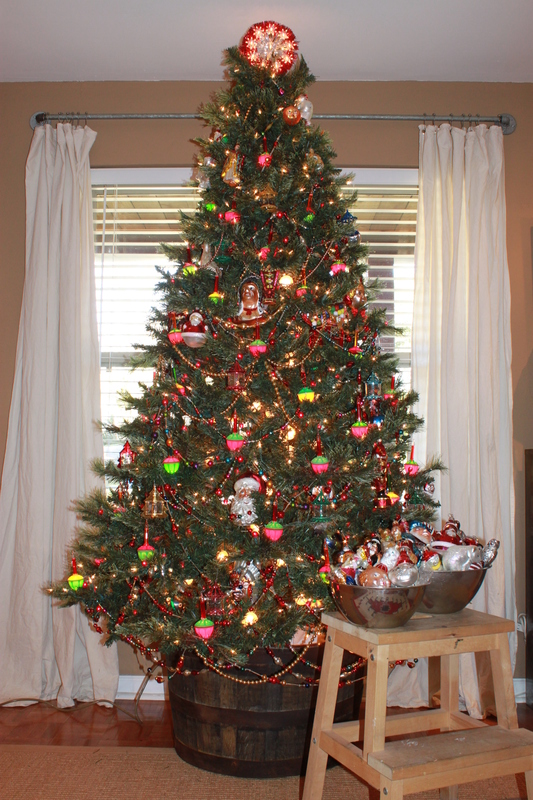 Drape that Mantel like a Pro…..
Our mantle seemed a little bare of Christmas Cheer this year. Y’all are pro’lly thinking, “How could they possibly cram anything else up there.” OOOhhh, just you wait. Usually we just tuck pine into all the available crevices on the mantle, completely covering all the wood like a “pine blanket”, but this year we tried to make it slightly more “sophisticated”. 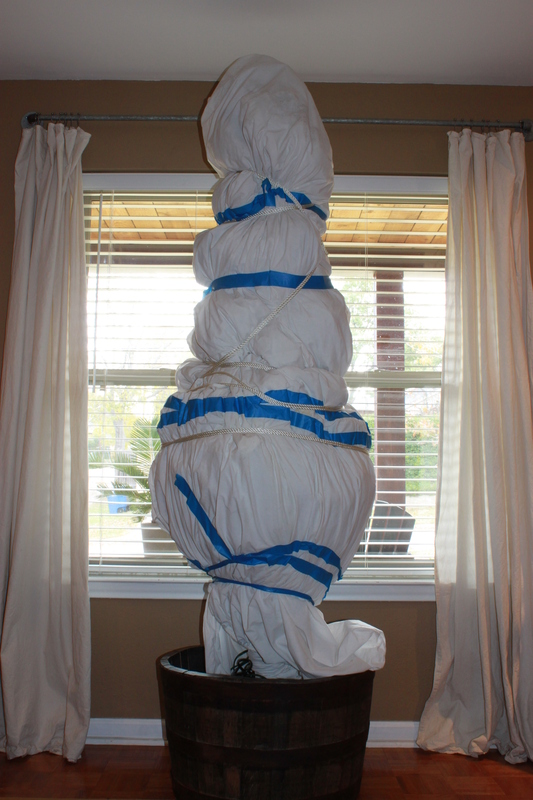 I started with about 12 feet of nylon rope….enought to gently drape over the top of the mantle and down about 4 feet on either side. Then I just wired small bundles of branches to the rope with floral paddle wire….. 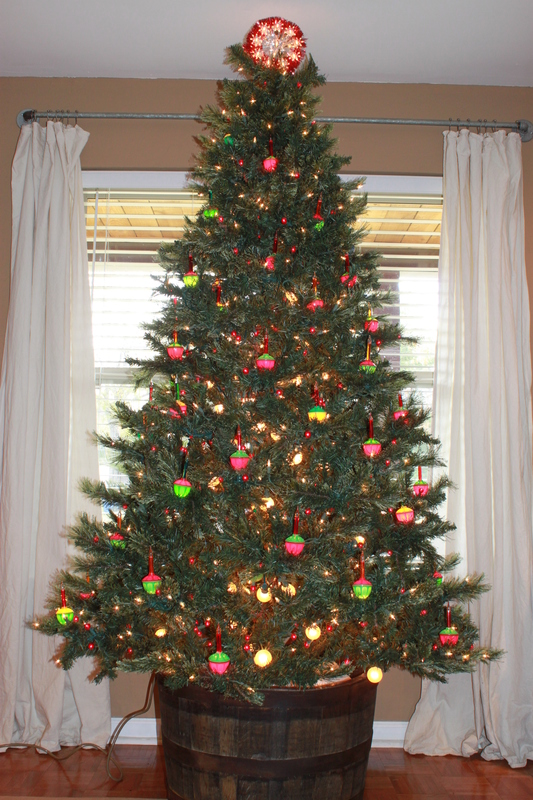 If all the little branches are about the same length (10 to 12 inches) it only takes about 30 minutes to finish a 12 foot garland. I know this is kind of a familiar theme with us….so just bear with us because we had A LOT of pine branches stacked up in the garage and we will use every last one. How great does this look? Slithering across our mantle like an albino python hanging loosely over Brittany Spears’ shoulders…….Sort of. The stockings we made last year with Navajo fabric scraps and are held up with thumbtacks too. …there’s one for all 3 of us. Gotta run, our house will be filled with good friends and even better cocktails in just a few hours…. Have y’all ever shopped for silk pine garland and been severely disappointed by the poor quality? That’s why we have a few inexpensive tricks that we use to “beef up” that thin crappy garland the stores sell. Here’s what we got from Michael’s, or Jo Ann’s, or Hobby Lobby…wherever….same crap. At least it was half off. So it was only $3 a package. I don’t want to bore with too many tedious “in process” photos, so here are the condensed garland step-by-step photos. I think y’all get the idea. I’m crazy about these vintage punched tin reflectors. They fit over C-7 lights. C-7s are the “old-timey” screw-in outdoor lights your Grandparents used. Not the great big ones, those are C-9s. These are slightly smaller (and NOT LED – these reflectors won’t fit LED’s because they don’t unscrew). Next, I wove in a strand of clear C-7 lights with the vintage tin reflectors. We brought home a carload of them. My garland will look less “shaggy” if all the branches are about the same size…….So I trimmed everything down to about 10 to 12 inches long. Starting from the bottom, I just inserted the branch pieces into the garland all aimed in the same direction. Just like when I made that wreath. Overlapping and hiding all the heinous cords is the goal. The wire in the garland helps hold everything together….I use the crappy garland like “twist ties” to keep the fresh pieces in place where I need to. I made sure to pull the lights through the branches as I went. A few tucked away will give a soft glow, but most of them should be exposed to “air” if possible. The finishing touch was a handful of plastic berries from the craft store….just tucked in randomly. Now isn’t that Way, Much, More Better than that thin craft store garland? Nothing says “Christmas in Texas” more that a wreath with a dead animal on it. In the cool shade of the front porch, our pine garland will stay pretty fresh for the next couple of weeks. It’s the heat for the indoors that would dry it out in a few days. And Yes. We did paint the door red just for the holidays. Now go make a garland……. Some ideas for projects hit immediately. And some ideas develop over time, and only get better. I also happened to have a chicken-wire wreath form from Michael’s. I’ve seen hot-glued vintage ornament wreaths online, but never one this big. It’s almost 3 feet across. 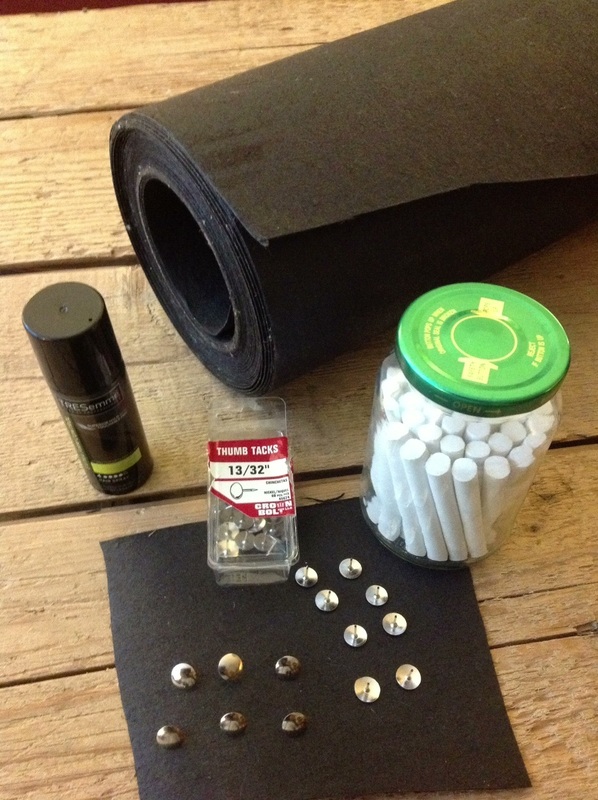 If I glued it all together I would never be able to store it…….or even move it without breaking several dozen. No, I have to assemble/disassemble this thing yearly. The wreath form already had a little bit of grapevine twisted over it, but I added the thin silk garland and a “zig-zagged” string of B-lights (just for a warm glow). I just started by hooking ornaments onto the chicken-wire wreath form…or the grapevine…or the lights…or even on that thin silk garland. Just as long as they are hooked into something. Beginning at the very bottom…..
….and slowly hooking my way up the sides to the top. Squeezing in as many as I possibly can. Several hours later…..I have this amazingness. 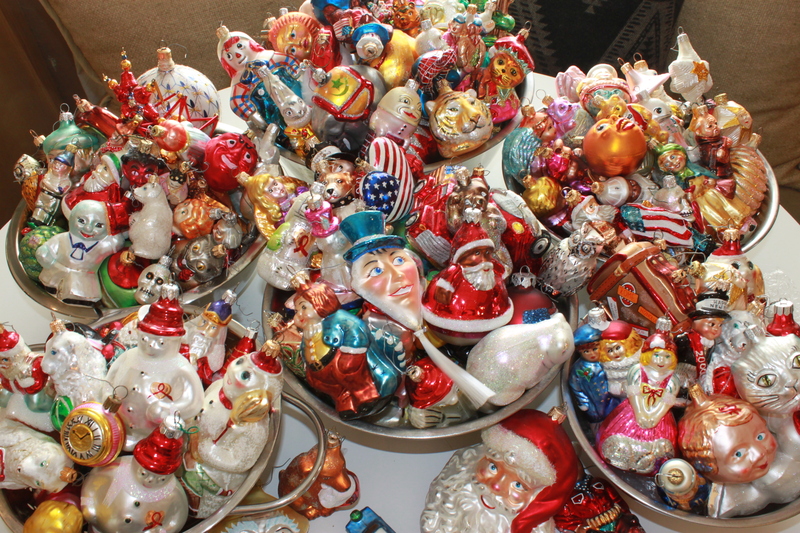 I wasn’t started in this direction when I first began collecting vintage ornaments…..
…but I’m sure glad that this is where the collection ended. My Mother tells the story of my first Christmas tree every year. 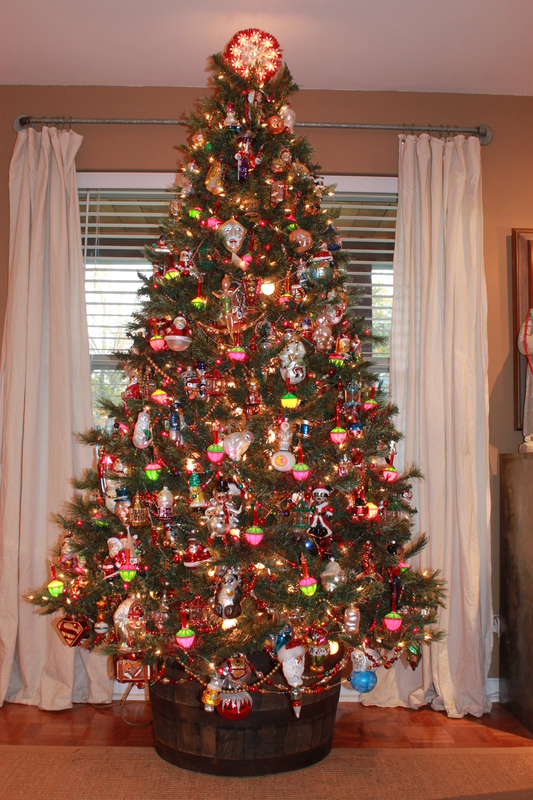 I was a little over 2 years old, and she, wanting to provide me with the most amazing first memorable Christmas ever, stayed up ’till the wee hours decorating my first Christmas tree. She expected me to be thrilled and amazed at how stunning it was. I didn’t quite have that reaction of awe-struck wonderment that she was expecting. Instead, when I looked over her decorating…I proceded immediately to correct all her mistakes. I removed every ornament I could reach, I was only 2 after all, and rehung them in what was certainly a much more pleasing configuration. My mother had no idea that would want to help decorate. She knew then that I was “different” and should probably be included in the ritual of the Christmas tree decorating. And from then on, I was. Eventually, I appointed myself “Chief Executor” of the family tree; deciding when to erect her (the day after Thanksgiving, of course), where the best placement in the family living room was (in front of the windows so the neighbors could enjoy her as well), and most importantly, where each individual ornament was hung. 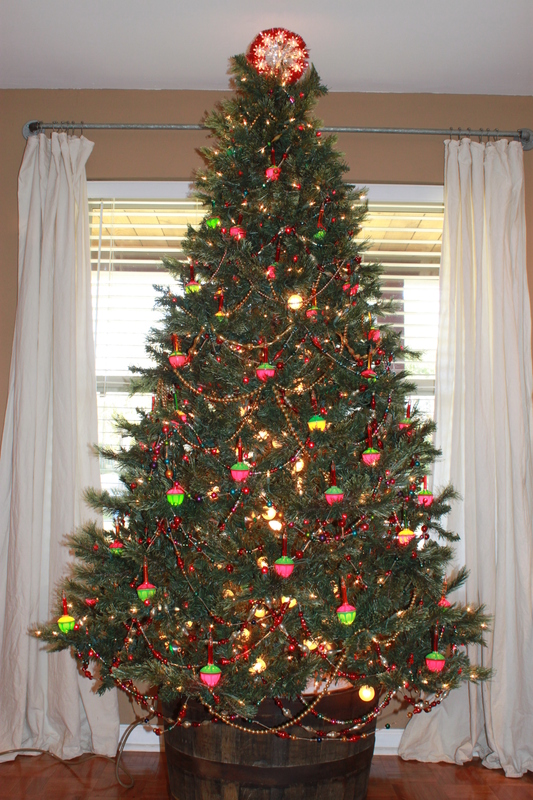 Last year I posted about the job of putting-up the family Christmas tree. 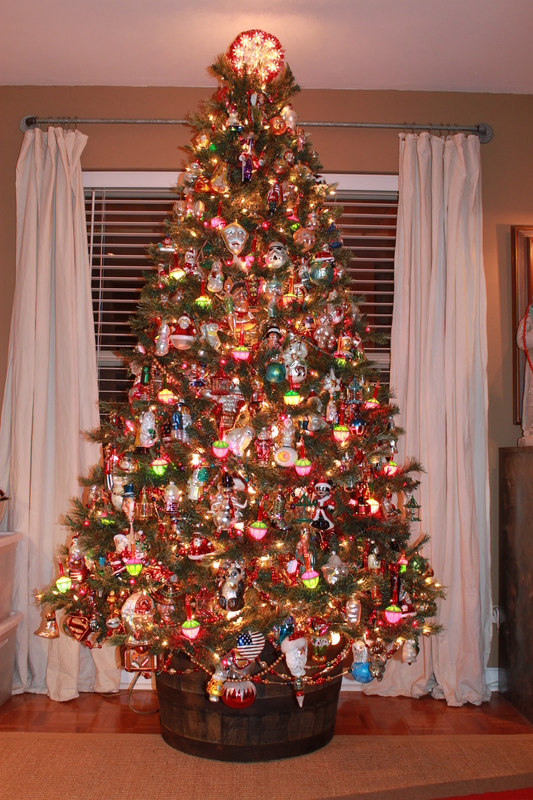 It’s 40 years later and it still means the world to me to assemble/arrange/install/decorate my Christmas tree…..and to layer it with the memories I’ve collected all my life. Here is that process shared with you kind folks. She looks like a pear-shaped corpse about to be dumped in a ravine by the mob when we first pull her out of the garage and stand her up in the whiskey barrel. Yepp! Whiskey Barrel this year…we thought we’d take a break for the galvanized wash tub, and try something new. Something else new this year is the topper. Target had these cool retro-ish light-up star toppers for 5 bucks each. We thought they were kinda fun. So we bought 2 red ones, one for the front…..and one for the back. Since we set her up in the living room window this year, I thought passers-by would see the back side of the tree top through the window. 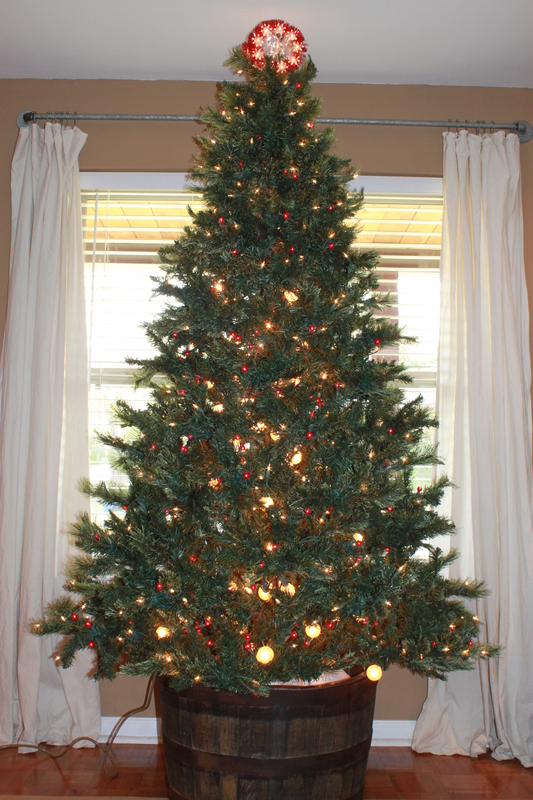 She looks more like a proper tree once she is fluffed and all the burned out bulbs are replaced……. This year I found them online at Boscov’s. I’ve never heard of them either. But they have bubblers, and cheaper than Target. They are also available at Ace Hardware, same price. Glass bead garlands are draped, and draped, and draped…. Last year Jamie restrung some garlands that we picked up at Restoration Hardware after Christmas the year before. He added bugle beads and mixed the colors on every strand. SO we have plenty. The ornaments take the longest time. I’ve been collecting German, Polish, Czech and Italian glass ornaments for about 20 years now. Most of them are Christopher Radko. He revived the dead industry of European glass ornament making and I’m pretty drawn to the ornaments that use vintage molds. I mostly find them on eBay all year long, when they are the cheapest. When they arrive I quickly stash them away. Pulling everything out the day after Thanksgiving is always a treat to see which ones are new. Mosly there are Santas, snowmen, Mickey & Minnie, cowboys, indians, story book characters, bears and dogs. As I unbox each one, and unwrap it from the bubble wrap cocoon, I fill mixing bowls with them to load on the tree….squeezing the biggest ones into the branches. The top gets a headdress of vintage glass bead spikes….I’m not really sure what they are, but they go on top. The final step ia a layer of tinsel icicles. That’s right. Tinsel Icicles. “Do they even make that stuff anymore?”, you may ask.